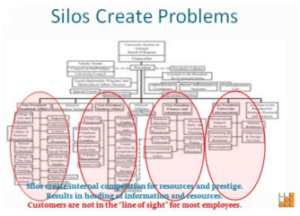 The traditional organizational chart is known for creating internally competitive silos where resources are horded and fiefdoms are protected at all costs. It adds layers of bureaucracy and cost but most importantly, the customer is nowhere to be found… Does this look familiar? 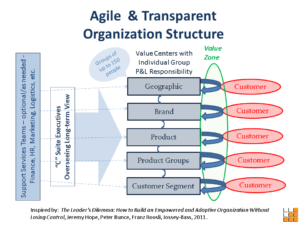 The value centers would be grouped in a way that made sense based on the organization’s business model. The value center teams would ideally be groups of up to 150 people for effectiveness. The value centers would be cross functional teams designed by the members and would not be limited to operations personnel. Subject Matter Experts can be made available to the team or be full-time members of the team, as deemed appropriate. Transparency makes information available to everyone and supports knowledge sharing across the organization. Every team interfaces with customers daily. 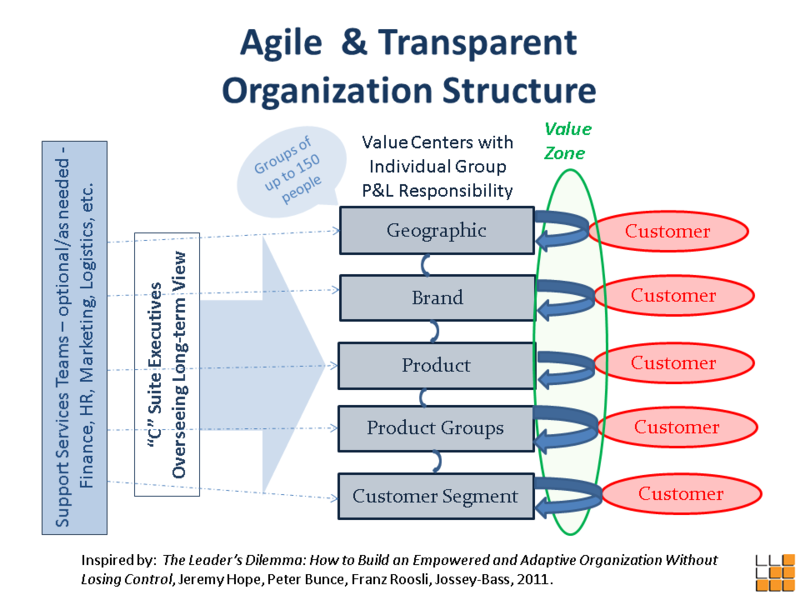 The Value Zone is the benefit the organization would reap in immediate customer feedback in product and service improvements, innovation, product/service bundling, etc. Value Centers would be free to place small bets through experiments with willing customers on new product and service ideas. The C-Suite executives would be responsible for keeping the organization on track with the long-term vision, obtaining and allocating resources using venture capitalist like parameters (knowing when to hold them, when to fold them, and when to reconfigure them), and keeping watchful oversight. The key points are that it is flexible, holds everyone accountable for results, and demands trust and transparency to really work.